This work assesses your knowledge and focuses your learning. Packed with visuals to help you learn fast, the book includes dozens of troubleshooting scenarios. An accompanying DVD-ROM also allows you to practice at home using electronic test engines, lab exercises, and study note... read full description below. Mark Edward Soper has been working with PCs since the days of the IBM PC/XT and AT as a salesperson, technology advisor, consultant, experimenter, and technology writer and content creator. Since 1992, he has taught thousands of students across the country how to repair, manage, and troubleshoot the hardware, software, operating systems, and firmware inside their PCs. He has created many versions of his experimental computer known as FrankenPC for this and previous books. Mark earned his CompTIA A+ Certification in 1999 and has written four other A+ Certification books covering previous and current versions of the A+ Certification exams for Pearson imprints. Mark has contributed to many editions of Upgrading and Repairing PCs, working on the 11th through 18th and 20th editions; co-authored Upgrading and Repairing Networks, Fifth Edition; and has written two books about digital photography, Easy Digital Cameras and The Shot Doctor: The Amateur's Guide to Taking Great Digital Photos. In addition, Mark has contributed to Que's Special Edition Using series on Windows Me, Windows XP, and Windows Vista and to Que's Windows 7 In Depth. He has also contributed to Easy Windows Vista and has written two books about Windows Vista: Maximum PC Microsoft Windows Vista Exposed and Unleashing Microsoft Windows Vista Media Center. Mark has also written two books about Windows 7: Easy Microsoft Windows 7 and Sams Teach Yourself Microsoft Windows 7 in 10 Minutes. Mark has also created a number of hardware tutorial videos available from the OnGadgets&Hardware podcast channel at www.quepublishing.com. Mark has also written many blog entries and articles for MaximumPC.com and Maximum PC magazine. He has taught A+ Certification and other technologyrelated subjects at Ivy Tech Community College in Evansville, Indiana. See Mark's website at www.markesoper.com for news and information about upcoming projects. David L. Prowse is an author, a computer network specialist, and a technical trainer. 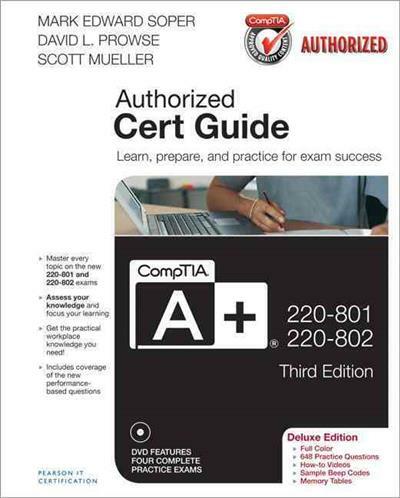 Over the past several years he has authored several titles for Pearson Education, including the well-received CompTIA A+ Exam Cram. As a consultant, he installs and secures the latest in computer and networking technology. Over the past decade he has taught CompTIA A+, Network+, and Security+ certification courses, both in the classroom and via the Internet. He runs the website www.davidlprowse.com, where he gladly answers questions from students and readers.